Richard Robinson, assistant professor of materials science and engineering, in his lab with graduate student Don-Hyung Ha, left, and postdoctoral associate Haitao Zhang. At one point, Richard Robinson considered becoming a bus driver. After all, as a middle-class African-American kid growing up in Indianapolis, he knew he had to do something – and it seemed a fine career. But as an eighth-grader, with the help of a National Science Foundation program aimed at minority students, Robinson discovered science and engineering. That was the spark that took him all the way to where he is today: a member of the Cornell University faculty in the College of Engineering. 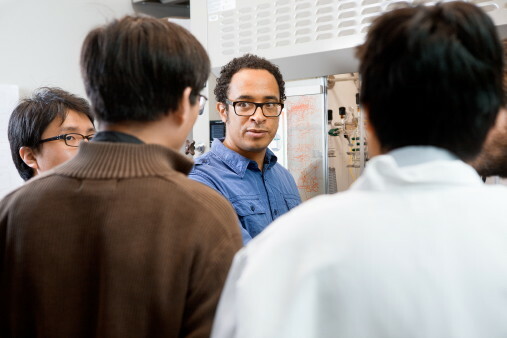 Robinson, an assistant professor of materials science and engineering who researches the chemistry and physics of nanoparticles for energy applications, is now part of his college's – and Cornell's – changing face. Before joining the faculty in 2008, he was courted by other institutions. Cornell's boldly stated commitment to diversity helped tip the scale in its favor. "It convinced me Cornell was a better place to go," Robinson says. "That's one of the reasons I came here – there is no question about that." Cornell, along with other top research universities across the United States, is facing a formidable challenge in the next five to 15 years. A third of its faculty is nearing retirement age, and as the university's Strategic Plan states, significantly increasing "the diversity of faculty through new hires and enhanced retention efforts" is paramount. Stated goals focus on "gender, racial and ethnic diversity" of faculty in all units. The College of Engineering set specific diversity targets in its own strategic plan, published in 2004. Under the leadership of then-dean, now Cornell's provost, Kent Fuchs, the plan set 2015 goals for increasing underrepresented minority faculty members to at least 7 percent and women faculty members to at least 20 percent.